This document presents a framework of the essential and desirable knowledge, skills and attitude attributes for any person in the mental health and addiction workforce who is working with a Pacific person, people or their families. 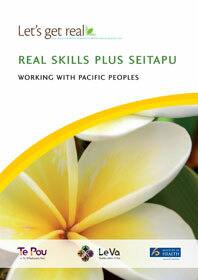 The development of the Real Skills plus Seitapu framework has come about largely in response to the Seitapu framework. Seitapu is a framework of Pacific cultural and clinical competencies designed to be used by all mental health workers and organisations providing services to Pacific people (including services specifically for Pacific people, and people in any setting who work with Pacific people). Seitapu was developed by Pava on behalf of the Ministry of Health in 2006. While, at the time, Pava was a relatively new organisation, the people contracted to undertake the work included some of the most skilled and knowledgeable leaders and practitioners from the areas of social research, addiction practice, mental health practice and mental health consumer advocacy in New Zealand’s Pacific communities. They also represented a wide geographical spread both physically and ethnically. The Ministry of Health also developed a base framework of the knowledge, skills and attitudes required of workers in both district heath board and non-government organisation mental health and addiction services in order to deliver the most effective services for service users; Let’s get real: Real Skills for People Working in Mental Health and Addiction. This Real Skills plus Seitapu framework should not be seen as a replacement for Seitapu, nor should it be seen as a continuation. While the content retains much of the original essence and integrity of Seitapu, Real Skills plus Seitapu is a consolidation only of those aspects of Seitapu that can be aligned to the Let’s get real framework without altering the intent of either framework. This document is intended as a companion document to the Let’s get real framework, while Seitapu remains, for all intents and purposes, a framework that applies to the specialised provision of Pacific services (i.e. by Pacific for Pacific). The Real Skills plus Seitapu framework provides an outline of the considerations that should be taken into account by New Zealand’s mental health and addiction workforce when working with Pacific people. It is intended to infuse Pacific knowledge, skills and attitude throughout the mental health and addiction sector, empowering services and people to become more responsive and accessible to Pacific service users.